India on Sunday successfully launched its 100th space mission with the native PSLV-C21 rocket putting in orbit two foreign satellites. In a copybook launch, witnessed by Prime Minister Manmohan Singh, ISRO’s workhorse PSLV placed in orbit France’s SPOT-6 satellite and Japanese spacecraft PROTIERES, some 18 minutes after a perfect lift off from the Satish Dhawan Space Centre here. The launch, scheduled for 9.51 a.m., was delayed by two minutes at the end of the 51-hour countdown. The Polar Satellite Launch Vehicle (PSLV), on its 22nd flight, soared into an overcast sky at 9.53 a.m. carrying the 720 kg French satellite, the heaviest satellite to be launched by India for a foreign client. The mission was described as “a spectacular success” and a milestone by Mr Manmohan Singh, who keenly watched the entire launch sequence and applauded each stage separation culminating in the placing of the two satellites in orbit. The launch was a landmark for Indian Space Research Organisation (ISRO) which began its space odyssey on a humble note when it launched the indigenous ‘Aryabhatta’ on board a Russian rocket on April 19, 1975. 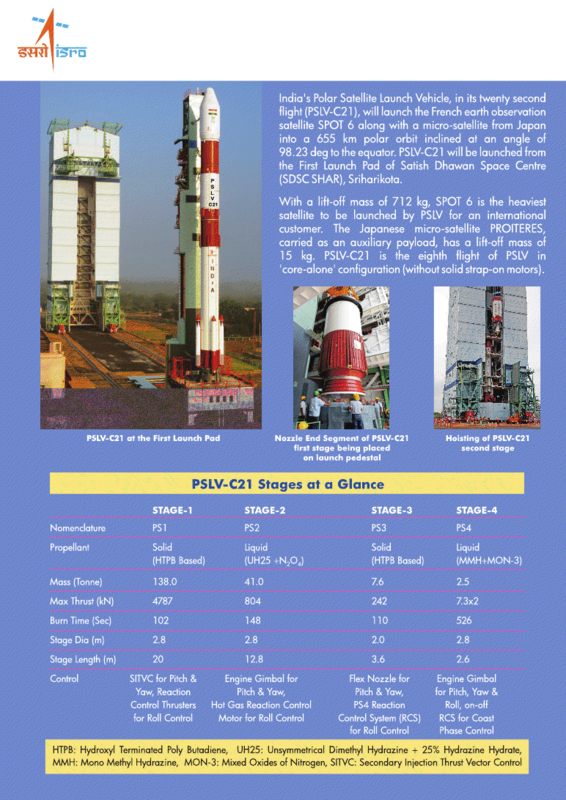 The launch has yet again demonstrated the versatility and robustness of PSLV with the rocket completing its 21st successful mission in a row since its first failed flight in September 1993. No Indian satellite was onboard today’s flight which is the third wholly commercial launch undertaken by ISRO for foreign clients. SPOT-6 is the biggest commercial lift so far since India forayed into the money spinning commercial satellite launch services after 350 kg Agile of Italy put in orbit in 2007 by PSLV. Twelve other foreign commercial satellites launched by ISRO weighed below 300 kg. Significantly, France’s five earlier SPOT satellites were launched by European Araine rocket. SPOT-6, built by ASTRIUM SAS, a subsidiary of EADS, France, is an earth observation satellite, while the micro satellite PROITERES, developed by students and faculty of Osaka Institute of Technology, will study Kansai region of Japanese island of Honshu.